Keeping in front the Ideals and Lofty Teaching of Holy Master Swami Sivanandaji Maharaj “Serve, Love, Give, Purify, Meditate & Realize”, the Spiritual and Yoga activities at the Ashram have been flourishing day by day and ashram has blossomed into a beautiful Spiritual and Yoga center. People from all over are visiting the Ashram and evolving in their quest for achieving the Goal of Life, “GOD REALIZATION”. Daily Yoga Classes at Sivananda Ashram for the established yoga students are offered in three sessions in the morning, from 5.30 am to 6.45 am, 7.00 am to 8.00 am and 10.30 am to 11.30 am. For the novice in Yoga field ashram offers classes in two sessions each month from – First to the tenth in the morning 5.30 am - 7.00 am & Fifteenth to twenty-fifth in the evening 6.00 pm to 7.30pm. Special classes for women are held in two sessions every day from 4.00 pm to 5.00 pm and 6.00 pm to 7.00 pm. On Feb 20, 2005 fifty participants took advantage of “Mahashankh Prakchalan Prakriya (Bowel cleansing Kriya). It was planned on the initiatives of Ms. Sangeeta Thawani, Mr. Tapan Mankodi & assisted by other yoga teachers of the Ashram. 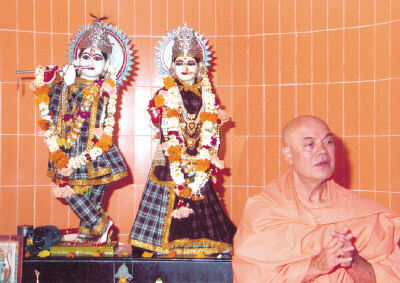 On April 29, 2001 H. H. Sri Swami Chidanandaji Maharaj inaugurated “Sri Swami Chidananda Dhyan Mandir (Meditation Hall)”. Since then devotees have been enjoying its serene and holy atmosphere, perfect for meditation and contemplation. Because of increasing Yoga and Spiritual activities at the ashram and participation by the devotees, space is a little problem. So the ashram administration, after careful consideration making it available for Yoga sessions at certain hours, when it is absolutely needed. The hall has a huge Mantra collection “built in structure” and about six Crores (Sixty Millions) of written Mantras by devotees have been placed in it so far. The REIKI sessions for Level I & Level II were held in the month of February under the guidance of Mrs. Rupa Majmudar. This month an herbal drink “(Kadu Kariyatu)” was served daily in the morning from 6.00 am.7.30am to all. It is an ancient medicinal remedy prepared from many herbal leaves, supposed to be good for general health and vitality. About two hundred fifty to three hundred people tried the drink for good health. As always, this month daily Evening Satsang (9.00pm –9.45pm), Sunday satsang (8.30 am -10.00 am) and ‘Paduka Pujan' on Thursday were performed at the Ashram. Also Bramachari Shri Mukund Chaitanyaji has started daily discourses on “Ishopanishad” (Monday –Friday) at the Ashram’s Satsang Bhavan this month, which was attended by many devotees. As always the, first Sunday of this month 675 kg wheat and grain were distributed to poor and needy families through “Vishwanath Seva Kendra”. Also each Friday, nutritious food in packages containing chapatti, vegetable, sweets, snacks etc. were served to the underprivileged children of the city. We had a few guest at the Ashram in the month of February. A group of devotees from Divya Jivan Sangh, Ambala arrived with Dr. Om Prakash Sharma, a president of DJS, Ambala, stayed (Feb12 to Feb 22) at the Ashram and enjoyed its holy atmosphere. They went on the pilgrimage to “Dwarka” from here. Also students of the Aravalli institute of Management, Jodhpur, were the guest received at the Ashram from Feb 16- Feb 20. They enjoyed the satsang with Sri Swami Adhyatmanandaji Maharaj. On Feb10, 2005 Ahmedabad Rotary Metro arranged their meeting at Ahmedabad Gymkhana Conference Hall. Pujya Swamiji was invited to grace the occasion. He spoke on the subject of “Spiritualities and Science”, which was well received by all. On Feb 25, 2005 a felicitation ceremony was held by the Gujarat Red Cross Society at the Ahmedabad Management Association in the presence of the honorable Governor of Gujarat as the Chief Guest. Gujarat’s first female centurion blood donor Ms. Ketki was honored. Also Rev. Swami Adhyatmanandji (donated blood 117 times) and thirty -two other donors were recognized for their humanitarian services of blood donation many times. "Gujarat Divya Jivan Sangh”, Bharuch branch organized a week long morning Yoga sessions and evenings discourses on the subject of “Gita Navnitam” by Sri Swami Adhyatmanandaji. Artists belonging to “Sri Keshavdip Sangeet Kalakendra” and “Pandit Omkarnath Sangeet Kendra” presented devotional music prior to Swamiji’s lecture each day and charged the atmosphere with divine vibrations. During his stay at Bhruch, Pujya Swamiji, among the other activities, visited underprivileged people in the Muslim colony and brought a moment of joy and happiness among them. The executive of Gujarat Narmada Fertilizer Company celebrated a special ‘Yagna Samarambh’ on the occasion of ‘Narmada Saptami in august presence of Pujya Swamiji, where He spoke on the subject of “production problem & solution through yoga” and inspired them. Tree plantation was done at various places here. At Shamlaji, Pujya Swamiji visited “Annakshetra”, which was started by one of the greatest Saints of Gujarat, Brahmlin Sri. Dongreji Maharaj. The Yajna was organized by the devotees for the construction of Shri Laxminarayan Temple and “Murti Pratistha”. Thousands of devotees were gathered for this holy occasion and were in joyous and festive mood. Pujya Swami Vaikunthanandaji Maharaj of Sivananda Ashram, Rishikesh and Shri swami Gurusevanandji Maharaj of Khedbrahma and Pujya Sri Swamiji Adhyatmanandaji graced this occasion and inaugurated a large Satsang Bhavan. Rev. Swamiji spoke on the importance of ‘Satsang and Swadhyaya’. It was inspirational for devotees. The host of this ceremony was the family of Shri Dilip Gandhi of Himatnagar. ‘Gujarat Divya Jivan Sangh’ organized a week long yoga Shibir of Sri Swami Adhyatmanandaji at Ankleshwar, GIDC. “Gita in daily life “was the subject of evening discourses. Shri Nikhil Raval, a manager of Hoechst (a manufacturing medicines co.) provided pleasing devotional songs daily before the lecture. Galtu Vidyalaya arranged a book fair there. Among the other books Sivananda literature were also made available for the people. During his stay, Rev. Swamiji visited the ‘Ramakrishna Vivekanand Kendra’, many industrial houses and devotee’s home at their request. 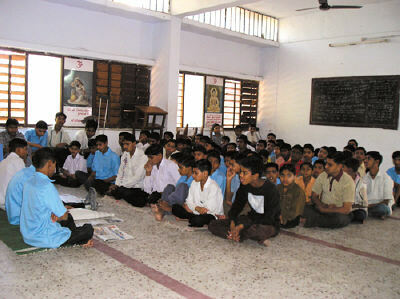 Last day of the Shibir was a special treat for children. It was highlighted by a cultural and entertainment program for kids, garbas and potluck dinner in the front garden of well-known Hotel Shalimar. The credit goes to the diligent work of Shri Sumantrai Desai of Gujarat Divya Jivan Sangh & the trustee of Sivananda Hospital, Bharuch and the retired Chief Engineer of GIDC, Shri Pramod Desai. As usual during his stay at Bharuch & Ankleshwar, Pujya Swamiji was invited at various schools, educational institutes and a graveyard, structured by the Ankleshwar Rotary. Tree plantations were also carried out everywhere. Mehsana: “Mehsana Vidya Uttejak Mandal” celebrated their golden jubilee year. Sri Swami Adhyatmanandaji was invited to grace the occasion and he inaugurated “Ambedkar University Kendra” of this institute. Graduating students of the institute were honored at this ceremony. The institute made three new computer rooms available for students. Blood donation drive also was arranged. The vice chancellor of North Gujarat University, many dignitaries and many senior scholars attended this function. 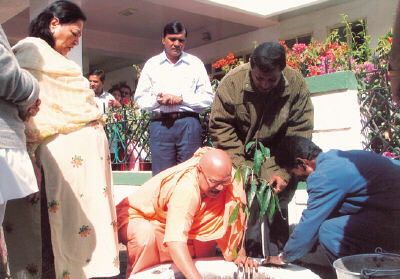 Pujya Sri Swami Adhyatmanandaji Maharaj arrived here in the morning of Feb 20, 2005 and inaugurated Yogasana camp at vast lawn of the Rehabilitation center. 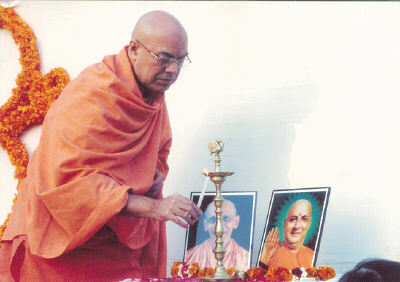 Swamiji was in Adipur till the Feb 26, 2005. During his stay, Swamiji visited Sri Sadhu Vasawani International Educational Institute, Arya Samaj, “Navprabhat” - an orphanage home, which cares for the children who have lost their parents in the earthquake. Also visited Rotary organized institute for the deaf and dumb “Hari Aasro” and other educational institutes. Lectures by Swamiji were held at the Samadhi of late Dada Dukhayal and Smruti Mandir. On the last day Tratak Kriya was taught. Pujya Swamiji also was present at a special ceremony of unveiling the statue of late Dr. Shobhraj Ruchani, the founder of Sivananda Hospital, Adipur. 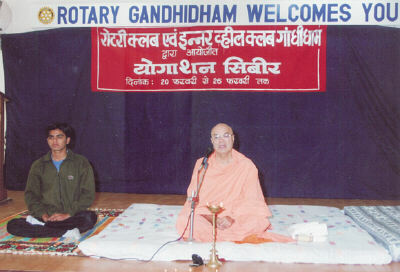 Gandhidham, Adipur: At Gandhidhaam, Swamiji conducted Yoga Classes organized by a Rotary Club. Satsangs and lectures were held at various places including Inner wheel Club, Arya Samaj, Colony of Kandla Port, Gopalpura, various educational institutes of Gandhidham, Sadhu Vasawani Nirvasrit colony, Jain Parivar samuh etc. On Feb 24, satsang at prayers were organized by Sri. Jamiyat Vora at Bhuj. 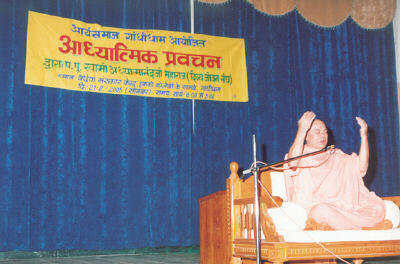 Five talks of Swamiji were recorded for radio program by "Akashwani Bhuj." On Feb 27, 2004, Rev. Swamiji attended a special ceremony, where bronze statue of a great Poet of Gujarat Sri Narmad” was unveiled at he cross road of the famous Harani airport. On this occasion Sri Bhagyesh Jha, the collector of Baroda and the Mayor of Baroda Municipal Corporation also remained present. Swamiji spoke few words in his praise that in history of poetry, Poet Narmad holds an unique place in Gujarati literature. He had brought a revolution and Gujarat can take great pride in him. At Valsad, Governor of Gujarat inaugurated the occasion of 100th anniversary celebration of Sri Vidya Amrut School and conclusion of the “Purah Yajna” on Feb 27, 2005 was performed by Sri Swami Adhyatmanandaji. Swamiji gave an inspirational lecture on the topic “Necessity of the study of Piranhas in the present human life.” Divya Jivan Sangh, Valsad branch organized morning yoga sessions and evening lectures on Bhagwat Gita at well-known “Moghabhai Desai Hall” of the town.